I was approached just over a week ago by Steve Dempsey who writes for the Irish Newspaper: The Sunday Business Post. Q1. How would you explain to a technophobe grandmother how mobile technology is changing journalism? I would explain, in simple terms, the role of each of these pieces of equipment and the highly skilled people who operate them in making the evening news bulletin. I would talk about how a television journalist works with these different people to create their stories for the news or how it happens that a journalist can appear live on air. Once I can see that the “granny” has understood the process, roles and logistics of traditional news gathering I would take an iPhone out of my pocket, connect it to her television and play a news story shot by one of our mobile journalists. Then I would ask her did she notice anything different from the stories she sees each night on the news. If we have done our jobs well, then she should notice no discernible difference save perhaps the subject matter is a little lighter than the “top stories of the day” and it is at this point I would demonstrate, not explain, how the story was shot and potentially edited using just the mobile device and a few small accessories. The second part of the demonstration would feature a bag of traditional journalism equipment. In the bag would be a radio, a laptop, a pocket stills camera, a consumer dv video camera, a minidisc audio recorder, microphone, headphone and notepad and pen. Then item by item I would demonstrate how the mobile phone has a similar function built in and how it really is the swiss army knife of the modern journalist. If the message was received – job accomplished. If not, for my last attempt, I would borrow a tale from Michael Rosenblum, who started the self-shoot journalism (video Journalism) movement. Rosenblum, who is speaking at the conference, uses the the introduction of the Gutenberg Printing press as an example of disruptive technology. He compares the process, roles and logistics of making a Bible by hand, the painstaking craft of creating the vellum, harvesting and sourcing the spices and berries to make the ink, the years of learning needed to become a scribe and the additional skills of the illuminator/illustrator – a process of immense skill and craftsmanship and one which produced about one exquisite, priceless Bible per year, per monastery. Then Gutenberg created a way to cast the characters needed to create typefaces and once he had those moulds he could create identical multiples of each character, then with care assembling those characters into sentences and paragraphs he could ink them and apply the ink to paper and in a fraction of the time to produce a page or an entire Bible. Rosenblum poses the question, how might the scribes and illustrators have reacted when they first laid their eyes on the work of Gutenberg?. Might they have called it inferior quality, poor craftsmanship, might they have gone further and cited his work as heretical and an insult to God? Several hundred years later Gutenberg’s Press is generally regarded as the disruptive force which created the modern print industry. The memory of the highly skilled scribes who handcrafted manuscripts on vellum are reserved for the annals of history. Q 2. Where are we in the evolution of journalism due to technology; tip of the iceberg, inflection point, or has most of the disruption you expect already occurred? A2. I believe we are in the early days of this disruption in journalism and mobile is only one aspect of that evolution. The iPhone was launched in 2007 so it will be 8 years old this year. 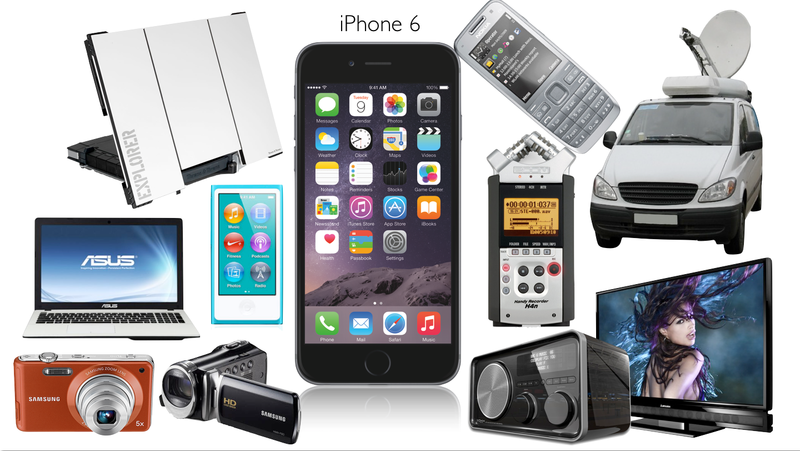 It has evolved a lot over this time and inspired many similar devices and platforms. Even at that, it is still not a mature product, there are several unfortunate limitations which are slowing adoption and preventing mobile journalism from becoming a truly mainstream solution. Those issues relate to battery life, storage capacity, robustness, lens and imaging chip specifications, technical standards and interfaces and cost. Most of the pioneering work that has taken place relating to mobile journalism has happened in spite of these limitations. There are now numerous accessories and workarounds available to overcome these challenges but these complicate the process, unnecessarily in my opinion. I do believe that we are probably about to surpass Moore’s law with regard to the technological development cycle of processors etc, the new challenge is in fact overcoming the obvious policy of manufacturers to build in annual obsolescence cycles and force strictly managed, year on year, modest incremental improvement policies. In other words the biggest thing holding back mobile journalism is not actually the evolution of technological capabilities, its the desire to maximise profit year on year by the manufacturers. Sure you might challenge that statement by countering, without the profit there would be no product, but I don’t agree. Mobile journalism at the moment is taking a selection of devices which are not strictly “built for purpose” and using software (Apps) to overcome some of those shortcomings and accessories to overcome the rest. Where the inflection point will appear is when one of the manufacturers decide the journalism & professional content creation market is ready for a dedicated product solution (or accessory) which combines all of the core functionality currently in use but with all the limitations listed above mitigated by being factored into the design also. There have been some attempts at this already, the Samsung Galaxy Camera, the Panasonic CM1 and a limited number of others but all these devices are aimed primarily at the general public with a few high end “niche” features to try and lure journalists to adopt them also. For me the most interesting thing here is that this bespoke device/accessory may not come from one of the big mobile manufacturers, it may evolve through a crowd funding campaign which will eventually be swallowed by one of the behemoths to take ownership of the IP and see if the product is ready for mass market production. While this process bubbles away in the background, new devices will come on stream that no one in mainstream media will have envisaged but which will leverage the highly connected global user base to bypass traditional delivery channels. 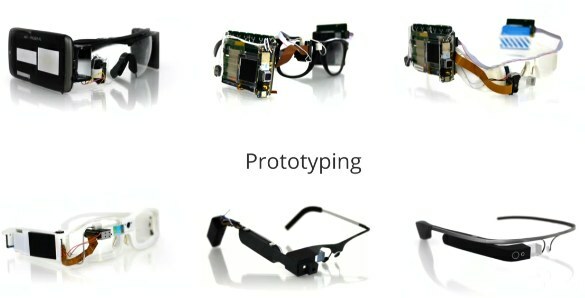 Though the jury is out on Google Glass, (I’m not convinced Google is finished with it yet,) I think all eyes will be on the Apple watch to see can wearables go mainstream. Glass may have received the lions share of publicity but there is an ever expanding range of alternative wearable cameras which will be far more discreet and less likely to provoke the ire of the “innocent bystander”. Also I believe 360º Video, Virtual Reality and Augmented Reality and RPVs (UAV’s/Drones) are all in their very early evolutionary cycle and will in time have an even more substantial impact on journalism and visual content creation. Q 3. How is the day to day job of the journalist changing due to mobile technology, and what does a modern, mobile journalist’s toolkit now look like? A3 That depends very much on two things, one, the attitude and aptitude of the journalist and two, the awareness and vision of their editorial team/management. I’m still surprised when I deliver presentations to management in organisations who are very obviously taken aback by the quality and diversity of content that can be produced with a mobile device. At the end of the day the journalist is a storyteller, what mobile content creation does is offer a new set of tools to allow the journalist to approach how they tell a story and most interestingly adapt the story for different platforms (print/online/mobile/radio/tv). The toolkit is very much dependent on the primary platform the journalist works for. Put simply the mobile tools that a radio reporter needs to fulfil their core role are quite different to those required to produce a mobile journalism story for broadcast television. That said, the principles of demarcation which defined and isolated these platforms are blurring at an unprecedented rate. Newspapers and Radio stations are now commonly producing their own live, WebTV shows. 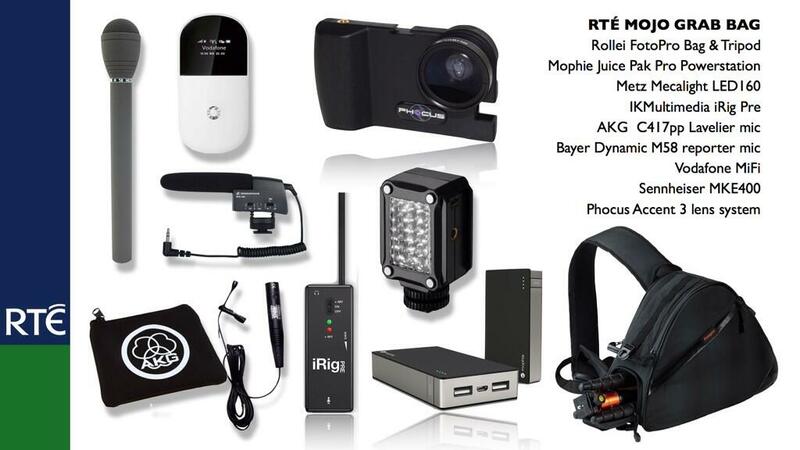 When I researched the accessories that I would ultimately recommend for the RTÉ mobile journalism project I chose solutions which fitted our specific needs. That said, if i were to do that project again now, three years later, I would choose some different accessories which have come onto the market since and which take advantage of the the latest operating system features and new connections. Q 4. What’s the 100%, full on vision of the journalist of the future? 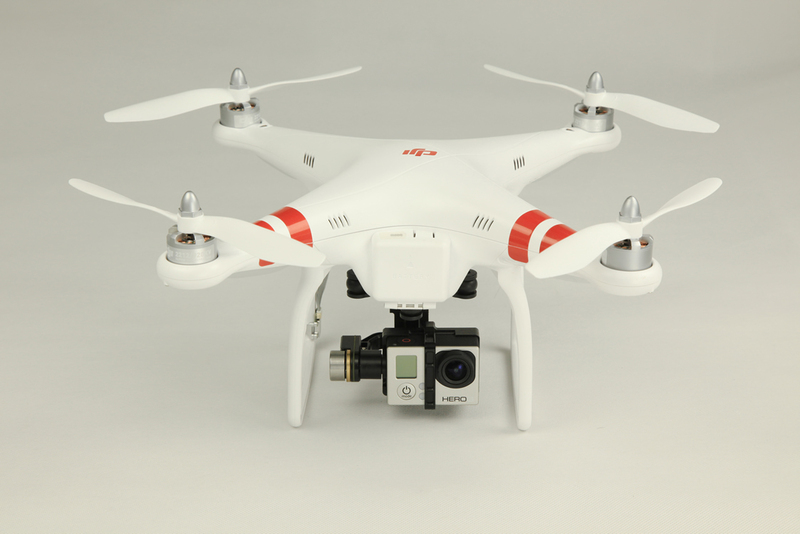 A reporter doing a piece to camera, filmed by a drone mounted camera – programmed to get B-Roll, which will be edited on the way back to the newsroom? What other Sci-Fi stuff can we expect? A4 As innovation lead part of my role is trying to predict and analyse trends which may have potential and which may be disruptive for our organisation. Oddly enough everything you’ve mentioned in the question is technically possible already. (note https://www.airdog.com | http://hexoplus.com) Forecasting beyond three years is where crystal ball gazing may be required though! I think the internet of things (IoT) and “Big Data” are the trends that journalists will learn to utilise going forward. More sensors, greater access to data and information will all contribute to journalists roles. Learning to search, collate, curate and verify content will become a prerequisite for journalists, it arguably already is. Faster connectivity, 4G+/LTE and eventually 5G will offer unprecedented connectivity speeds – with those come the potential for realtime remote collaboration, using the cloud to have multiple journalists/storytellers working on a combined story each contributing content and editing it collaboratively in realtime. I believe that Remote Piloted Vehicles/RPV’s (drones) will get smaller, cheaper, more intelligent spatial awareness, better image quality and longer battery life – with that will come greater regulation and risk management requirements but I have no doubt that live broadcast video from UAVs will become the norm in the next 12-18 months. The technology exists already. Live video is the one thing that is destined to grow exponentially. Mobile phones, GoPro cameras, DSLR’s all have or are getting realtime connectivity either built-in or via accessories. With all that potential live content how will it be consumed? Online on Mobile- via social media. This week Twitter introduced the Twitter Video platform with the ability to record and edit 30 second sequences and share them directly into your twitter timeline. Twitter is a realtime platform, once they deliver an API that can support a live video stream into your timeline (perhaps Live 360º video) the journalists ability to share realtime content with their audience will grow exponentially. 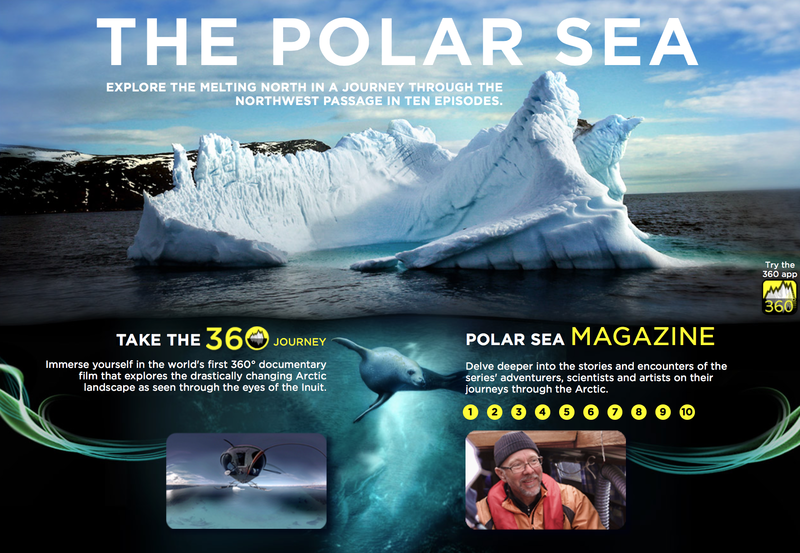 If you would like a great example of what that 360º video might look like then visit http://polarsea360.arte.tv and download their App. The other trend I’m watching with interest is personalised news/content. The vast amount of information we reveal about our digital life is been constantly analysed to serve us the most relevant ads, that information is ripe for being fed into an algorithm which will pump out personalised content. Platforms like Flipboard, Zite and others have been experimenting in this space for some time with mixed results but new metrics like device motion activity and eye tracking will allow those algorithms to fine tune content – possibly even measuring emotional sentiment from facial expressions. What would this mean for journalists? I think journalists have always had a “following”, readers, listeners, viewers who like what they say and/or how they say it. What hyper focused personalised content will offer is a new global audience for the journalists who have adapted to the concept of them as a “brand”, their stories, their product will develop an audience on an international stage once it strikes a chord with that audience. It will be a ruthless game though, where mediocrity and lazy journalism will vanish into obscurity – a survival of the fittest. You can see the early stages of this “own brand” content creation with the current generation of YouTube creators. For some, creating daily vlogs or video diaries for YouTube is enough to earn a living, for others, all the effort in the world won’t be sufficient to carve the niche necessary to secure a foothold and loyal following to make it financially viable and sustainable. One other side note. I believe mobile content creation is perfect for hyper local news and would love the chance to reach out to communities to empower them with the basic skills to create great video content, its been tried by many stations around Europe but has always been predicated on “consumer grade” video cameras and editing software on laptops. Mobile negates the need for that expensive kit, with a few basic accessories and some simplified training anyone can become a visual storyteller (not a citizen journalist). Q 5. Do journalists need to stay on top of technological developments to protect their jobs? A5 I think the core skills of a journalist are still the most essential part of the role. In fact I think fairness, objectivity, accuracy, impartiality, credibility, verifiability and sound editorial judgement are, and will continue to be, the cornerstone of journalism, irrespective of platform. However I think journalists have an opportunity to add value to their role by enhancing their skill set. Being aware of technology trends is not the same as being a super geek (as I’ve frequently been accused of) it simply means taking a little time to digest some information about the newest gear and if time and budget afford, buying, experimenting with and becoming proficient with these new tools can only be advantageous in the medium term. I’ve been writing a blog (https://tvvj.wordpress.com) about such tools for over five years now, which as much as possible gives an honest and impartial account of my tests on this equipment. If you are a Twitter user then you can readily find and follow influencers who test and review new gear also. Q6. How did the idea for the conference come about and are there any other conferences like it internationally? A6 There are lots of conferences held every year which seek to address shifts in journalism and news gathering. Similarly there are lots of conferences where the emphasis is almost entirely on equipment. Over the last three years I’ve spoken at over 20 such conferences around Europe and the Middle East and I’ve been struck, time and time again by the absence of a holistic approach to the topics. I took my combined experience from those events and put together a proposal to address what I saw as a substantial vacuum in the available conferences exploring the incredible potential of mobile content creation. When I pitched the MoJoCon idea to Richard Waghorn, RTÉ’s CTO and my line manager, I outlined the concept that I wanted to create the conference around the experience of the delegate. The idea translated into three core strands. One: The Plenary Sessions. To facilitate the delegate to come and hear experiences and case studies from pioneers and innovators from around the world who have all pushed the boundaries of mobile content creation. Two. The Exhibition. To have the opportunity to explore a selection of the accessories and Apps that make professional mobile content creation possible and if you wish, test out and buy the kit you will need. Three. The Workshops and Training. To offer the opportunity to learn from some of the best in the industry, with the option to choose two, 3 hour workshops designed to give the delegate the confidence to start their journey in mobile content creation. In hindsight there was a fourth element which has only started to become apparent now that the event is nearing fruition. Networking and building a global community of mobile journalists and content creators who can share, encourage, support and inspire each other going forward. Ironically several weeks after we launched Mojocon I was contacted by the ONA (Online News Association), an american non-profit journalism association with chapters around the world, who told me they were planning a mobile journalism conference for March in London and wondering how much crossover there might be. Luckily they wanted to focus quite specifically on optimising content for mobile and less on the content creation side. A number of speakers I had provisionally approached have since joined their lineup, mainly UK based ones but overall the impact has been minimal. I am not aware of any other dedicated conferences which explore mobile journalism, filmmaking, photography and storytelling in one event. Q 7. What keynote speakers/main attractions will be there? Who are you most looking forward to seeing? A7 Our two keynote speakers are in my opinion, exceptional. Richard Sambrook, Director of the Centre for Journalism at Cardiff School of Journalism spoke at the Future of News Session at the International Broadcast Convention (IBC) in Amsterdam in September and he was the talking point of the entire session. Richard was formerly the director of the BBC World Service and he will give a keynote on audience and content trends. Gerd Leonhard, is a futurist. I’ve been following him for several years after I saw a Ted Talk he did on the future of business, communications and media. He will deliver a keynote looking at future trends in journalism and the media and some of the topics I outlined earlier. Between them the delegates will get a state of the nation and the future disruptive trends and opportunities to watch. I’m personally particularly looking forward to the mobile filmmaking session. Conrad Mess has won numerous awards for his iPhone short films, Michael Koerbel was one of the first directors to make an iPhone short film and he subsequently was one of the directors of photography who took part in a controversial documentary called “Revenge of the Great Cameras Shootout” which compared cameras ranging in price for €80,000 down to €800 (the iPhone) to see if the audience could tell the difference. Ricky Fosheim is the director of “And Uneasy Lies the Mind” one of the very first feature length films shot using an iPhone – which is timely given all the recent buzz surrounding Sean Baker’s “Tangerine” Movie at Sundance. The photography session has a slew of great smartphone photographers, I’m really looking forward to both the presentation and Saturday workshop from Jack Hollingsworth but Dan Rubin is a phenomenal photographer also so looking forward to see what I can learn from him and the other photographers. Having my former colleagues Mark Little (Storyful) and Blathnaid Healy (Mashable) back in Dublin to join the social media panel is a highlight, I could go on and on. Have a look at the full list of speakers yourself and you’ll see the immense diversity and range lined up. Q 8. What will the conference offer the different tranches of media professionals? For managers the highlight of the conference will be to see the diverse case studies from individuals and organisations who have already embraced the potential of mobile. My experience of senior managers when talking about mobile journalism is they perceive it as a journalistic pressure group seeking a method to get the most expensive “trophy phone” available. Once they hear and see the real world examples and use cases I think they will seriously revisit and re-evaluate what mobile journalism can/could do for their organisation. There are some truly thought provoking case studies in the line-up. Coupled with that will be the exhibition where they can learn about the costs of equipment and the functionality they can achieve, all this assisting with building a business case for how, why and what to pursue strategically. For journalists working in the field they will get a chance to hear from and enter into debate with their peers from a substantial range of respected companies including BBC, NRK, CNN, Aljazeera, and more. All the sessions are designed to demonstrate and illustrate different content types that can be created using mobile. I’m hoping the diversity will be eye opening to all the delegates who may not fully understand how much can be achieved with a mobile device. The journalists I’ve met on training courses usually fall into one of three categories. 1. The enthusiast, who sees the potential, is ambitious and can easily connect the dots that join the additional skills with their professional value/desirability. 2. The procrastinator, who understands the value and gets the logic of mobile but is hesitant because of concerns about professional credibility (“how can I be taken seriously as a professional journalist if I take my phone out to shoot an interview?”) or more commonly are extremely worried about being ostracised by their colleagues who perceive mobile as a direct threat to their roles, by this I mean photographers, cameramen, editors etc. In truth mobile journalism is not a replacement or alternative but in fact an additional tool in the overall organisational strategy. Managers need to make it clear that mobile is not being embraced to cut costs or to reduce staff but in fact to empower every member of staff as a content creator. Tough crowd by all accounts. I’ve delivered training to journalists in organisations who are “very traditional” and perceive mobile content creation as just another way for management to squeeze more work out of them for no additional pay. Upon further discussion though it is usually apparent that there has been no dialogue with the journalists before the course. They have been sent, to participate, sometimes obliged to attend without any idea of the motivation or possible outcomes. If I was in that position I would be inclined to be suspicious too. To this group I would say this. The keynote speakers will give you statistical analysis of trends that will illustrate how your audience is getting their content, what they watch, what they don’t, what works and what doesn’t work and where these trends are likely to go. The plenary sessions will give you a very broad insight into global usage of mobile journalism and content creation in lots of different situations and scenarios. If nothing else, come and learn whats going on and at least be informed when the discussion finally kicks off in your organisation about mobile. Several people have expressed surprise that I included NGO’s and PR agencies in the target audience. But both of these groups can derive huge potential from the sessions. NGO’s traditionally commission TV crews to produce highly polished promotional videos to highlight their efforts and demonstrate where funding is being spent. I’ve long held the view that I would prefer a weekly/monthly video diary shot by an aid worker where they are working to explain their efforts, even if it is comparably raw footage, because with that rawness comes authenticity. NGO’s can use these videos and photographs from their field workers to document their efforts and share via social media all the various projects they are involved in. The benefits are more intimate, immersive content- more transparency and credit for their efforts. Yet most NGO’s have never even explored the potential of up-skilling their staff to produce this content, usually under the misimpression that it is too complicated/expensive etc. Similarly PR agencies often rely on traditional media to turn up at launches and press event to garner publicity but in fact they could use mobile content to create their own exclusive clips, interviews and content for their website, clients websites and social media. Again few PR agencies have even considered this potential. Last but not least, journalism and media students. The students studying media production and journalism today are graduating into a brave new world where “career for life” jobs are long gone and the best they might get starting out their careers is an internship. Yet some of the mobile filmmakers speaking at MojoCon managed to make entire feature films by thinking outside the box. Ricky Fosheim used crowdfunding platform “Kickstarter” to fund his film. For students, who often learn from academics that follow a tried and tested curriculum, but who are not necessarily always aware of the latest disruptive trends, the conference will give them an insight into opportunities they may never have even thought existed. Q 9. How’s registration going? Is there a big interest? Should people who are interested be rushing to get tickets? A9 I’ve been very pleasantly surprised by the feedback and interest to date. Over 50% of the tickets sold are for overseas delegates and with 44 days to go, overall ticket sales are ahead of expectation. Vodafone Ireland came on board as our partners for the event and their sponsorship was pivotal in making this event happen. I’ve dealt with a very small number of complaints (four in total) about the ticket prices being too expensive but this is not an event aimed at the general public, its strategically targeted at professionals and businesses and it is cheaper than many comparable industry events in the U.K. It is important to consider that bringing over 40 speakers from around the world to Dublin, providing accommodation for them and then the venue and catering and marketing budget means there are very real costs associated with running this event. Mojocon is not for profit, none of the speakers are being paid to speak, in fact the ticket prices are pitched to just break even. I was determined to keep the numbers intimate so there are only 300 tickets available in total, with less than 100 remaining now. To make it accessible to students there is a student discount code which you can request from us via email and a buy four, get one free group code also. I think it will be interesting to watch the remaining tickets sell over the coming weeks. We still have a few interesting announcements to make. A few more intriguing speakers to reveal, lots more Saturday workshops to announce and another couple of interesting sponsors to reveal too. Plus I will start a weekly Google Hangout on Air with a number of guests on each show to ramp up the mojo conversation. 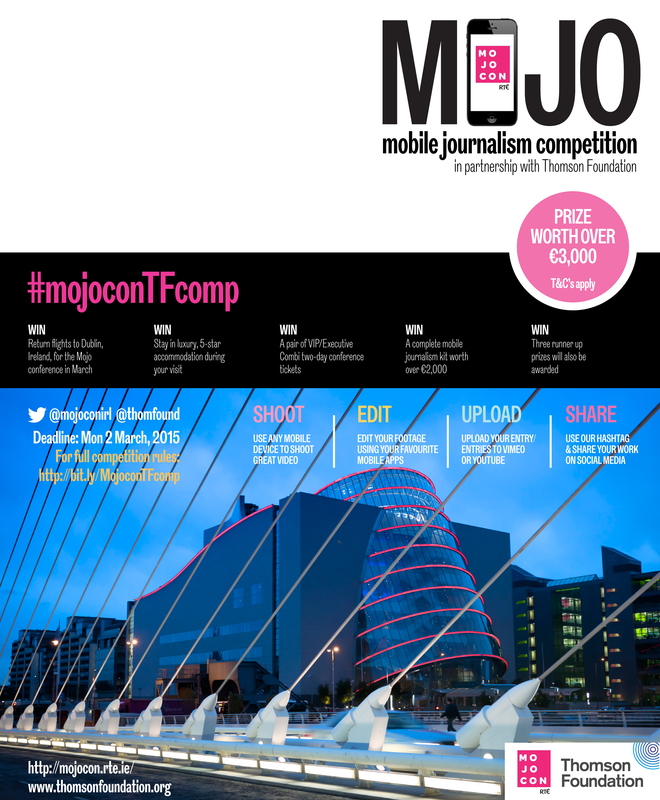 If the ticket prices are completely beyond reach for you, we are running a competition, in partnership with the Thomson Foundation, to win flights, accommodation, VIP tickets and a complete mobile journalism kit -all you have to do is create a mojo story that captures the imagination of the judges. Fabulous piece. What separates Glen’s analysis from others is the understanding that mobile umbrellas a broad number of techniques and there is a clear understanding when to deploy them; that I know from talking to him too. To concentrate on one e.g. the mobile phone, as a capture device, is to misunderstand that it’s not the equipment per se but the trade craft of the journalist and that the future too of videojournalism will be less about more, and more about the evolving lingua franca of video/film.